There are a lot of issues that go along with getting pregnant, and unfortunately pregnancy stretch marks are one of them. It is very common for women to suffer from stretch marks, which may become even worse during a second or third pregnancy. Pregnancy stretch marks can occur anywhere on the body, but tend to occur most often on the lower belly as it grows during pregnancy. What Are Pregnancy Stretch Marks? Pregnancy stretch marks usually begin to occur during the third trimester of a pregnancy, during which time a woman’s belly begins to grow at a very rapid pace. Stretch marks are simply the result of the skin not being able to regenerate itself at the rate it needs to in order to contain the underlying tissue. Pregnancy stretch marks are pretty much the same as stretch marks that are caused by other types of weight gain, including muscle gain, and rapid body growth during puberty. Can You Avoid Getting Stretch Marks? Even though some doctors will tell you that you cannot avoid getting stretch marks, the truth is that many women have been able to avoid this problem by paying very close attention to the health and nourishment of their skin during pregnancy. In fact, it is worth spending time on your skin prior to ever getting pregnant so that it is perfectly healthy and able to grow quickly while you become larger. The real key to avoiding pregnancy stretch marks is in adhering to a very strict skincare regimen. This really only takes a few minutes per day, but can result in you being able to live the rest of your life without stretch marks on your belly, breasts, thighs, or other parts of your body. Can Pregnancy Stretch Marks Be Avoided? There are several different ways that you can go about treating pregnancy stretch marks. The most common way is to condition the skin at least once a day, preferably after taking a bath or shower. By using a thick cream or oil after your skin is already warm and, you will be better able to allow the nutrients to penetrate into your second layer of skin. It is usually worth massaging the moisturizer into the skin for a few minutes so that it fully penetrates. Another way to avoid pregnancy stretch marks is to ensure that you are getting the proper nutrients in your diet. Most pregnancy vitamins will now include a number of nutrients that are specifically designed to encourage healthy skin during a time of growth. Many women have their own home remedies for avoiding for treating pregnancy stretch marks as they occur. Most of these involve using moisturizers during the first phase of the pregnancy. Even though stretch marks may not occur until much later, by encouraging healthy skin growth and renewal, you may be able to avoid stretch marks altogether. Natural ingredients that contain antioxidants, vitamins, and moisturizing agents such as bananas, avocados, honey, oatmeal, and yogurt. A high quality moisturizer with vitamin E, or a pure and natural cocoa butter cream can also do wonders. One moisturizer that we really like to help prevent stretch marks is Mama Mio Megamama Super-Rich Omega Body Lotion. In addition to finding treatments to avoid getting stretch marks and to treat them once they occur, it is also worth noting that there are several things that can make your stretch marks much worse. Exposure to the sun is certainly one of them, both during the time that they are occurring, and thereafter. While you are pregnant, you should do all that you can to protect your growing skin from exposure to the sun, and even after you have lost weight, stretch marks and scars of all kinds should be ejected from the sun. Dry skin will tend to make stretch marks more apparent, and that is the case on people of all colors. It is worth investing in a stretch mark cream, vitamin E oil or cream, or looking into natural home remedies that may provide you with more nourishment for your skin so that the scar tissue can begin to heal. In addition to creams, oils, serums, and other over-the-counter treatments, there are more intensive topical lotions that can help to encourage cell growth and renewal, enabling the scarred tissue to be replaced with healthy skin cells. There are also fractional laser treatments that can help to eliminate the dead cells and promote healthy collagen production. These can be expensive, sometimes painful, and embarrassing to undergo, but for women who suffer from extensive pregnancy stretch marks, laser treatments or products that contain retinol may be a much more effective option. One such powerful topical lotion that women report getting great results with is TriLASTIN. You can see example results in the picture below, and read our full review here. 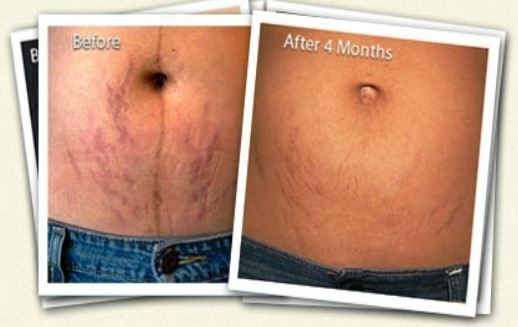 How Does Laser Stretch Mark Removal Compare To Creams?